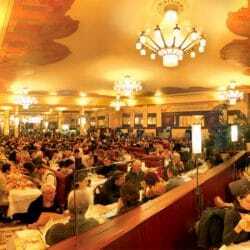 Famous Restaurants in Lyon – Paul Bocuse’s Restaurant, L’Auberge du Pont de Collonges: Also known as Paul Bocuse or Bocuse is the restaurant of internationally recognised master chef Paul Bocuse. The Bocuse family house and restaurant has become en essential stopping point for lovers of gourmet food from around the world. It’s an exciting world class dining experience provided by the father of modern French cuisine. Paul Bocuse (1926-2018) was designated “Pope of Gastronomy” by Gault et Millau Guide in 1989 and “Chef of the Century” by the Culinary Institute of America in 2011, he is the most famous chef in France and the precursor to the term “Nouvelle Cuisine”. 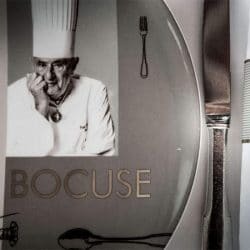 One of the first chefs to emerge from behind the kitchen door, Bocuse introduced lighter and more delicate dishes with greater emphasis on presentation. He served his famous “Black Truffle Soup” (VGE) at the Palais de l’Elysee in Paris in 1975, dedicated to French President Valéry Giscard d’Estaing, at the occasion of him being awarded the title “Ambassador of French Cuisine”. Considered one of the temples of French cuisine, this iconic restaurant is a mix of casual yet sophisticated service in a strikingly contemporary setting. The restaurant is run by Gilles Reinhardt who was awarded the title “Best worker in France” in 2004 and food is brought from the kitchen on trolleys and the final preparation takes place before the guests at their table, providing a much more attentive and entertaining dining experience. The restaurant offers diners the choice of an “à la carte” menu with starters ranging from €30 to €85, main courses of seafood, meat or poultry dishes from €65 to €80 and assorted deserts and cheeses for €40. Signature dishes include fois gras, lobster, marinated salmon, filet of sole, crayfish gratin, rack of lamb, filet of beef, scallops, sea bass, veal, chicken and more. There are also three different “ 3 course menus” ranging from €170 to €270 per person. The restaurant is located 4km north of Lyon next to the River Saone. An iconic French restaurant in a magnificent setting. The dishes on offer present the absolute finest in French cuisine. 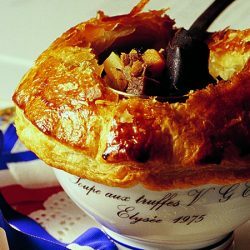 Learn all about the presidential Soup VGE made by Paul Bocuse. A story by Chef François de Mélogue ➡️ PART 2.